Artificial intelligence is increasingly applied to medical image analysis and for chest radiography such as Computer Aided Detection (CAD). Specifically for tuberculosis (TB), CAD4TB was the first algorithm that is validated in clinical and technical operational research studies. CAD4TB as a TB triage tool takes 20 seconds and can be used in individuals from 4 years of age. The probability of the presence of abnormalities consistent with TB serves to select individuals that benefit most from further testing with Xpert® MTB/RIF. Computer Aided Detection for TB (CAD4TB) developed by Dutch Thirona / Radboud University incorporating AI, now outperforms trained human readers (such as clinicians) to detect and quantify the probability of the presence of abnormalities consistent with TB . Partial financing for R&D was obtained from the Dutch Ministry of Economic Affairs & Innovations with support from CheckTB! CAD4TB can be operated offline on a laptop on site or in the cloud and is implemented in programmatic settings. CAD4TB has shown encouraging findings for the diagnostic accuracy in several sub-Saharan Africa countries, and recently in Bangladesh . Also other suppliers of computer assisted reading software for chest radiographs are now available, but these can be considered to be in the earlier phase of operational, technical and clinical evidence build- up. CAD4TB is currently under evaluation by WHO as part of a systematic review of available evidence. The development of the CAD4TB continues and may in the future also be used to detect abnormalities suggestive of silicosis, pneumonia, emphysema and lung cancer. At the recent UNION Conferences CAD4TB sensitivity and specificity scores on data sets from Bangladesh, Cameroon (Stop TB Partnership/TB REACH), Nambia (TB prevalence survey), Zambia (TB prevalence survey), Philippines (WHO), Tanzania (USAID), South Africa (Aurum / DCS inmate screening) and Zambia (TB prevalence survey) were presented, confirming the potential of CAD4TB as a rapid triage before Xpert® MTB/RIF. 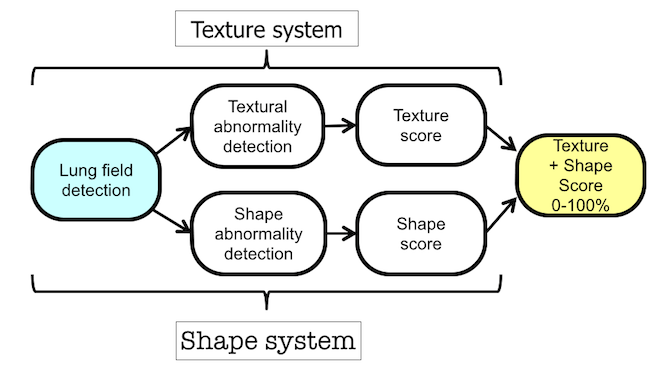 Texture and shape system abnormality detection and scoring are illustrated leading to the CAD abnormality score between 0 – 100. 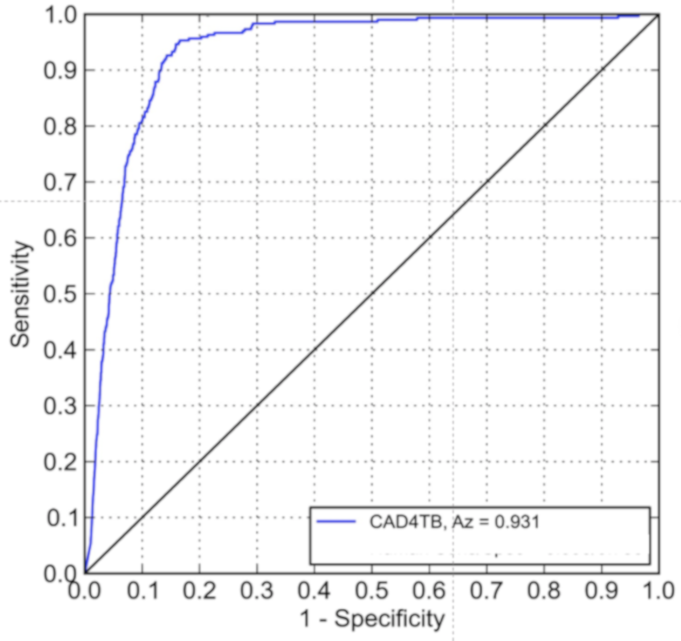 CAD4TB was developed to automatically detect tuberculosis-related abnormalities in posterior anterior chest X-rays. This computer-aided detection software takes a single chest X-ray as its input, in the form of a DICOM image, and produces several outputs: a quality assessment of the input image, a heat map highlighting possible abnormal areas, and a score between 0 and 100 indicating the likelihood of the X-ray being abnormal and the subject on the X-ray being affected by tuberculosis. The CAD system follows the general machine learning approach of supervised learning. In supervised learning the system learns from a set of examples, called the training data. The training data consists of a number of labelled images of which the TB status is known. For the CAD4TB system there are two classes and the labels are normal and presumptive for TB. A number of features is extracted from these images and combined to form a feature vector for each image. These feature vectors are used to train a TB classifier. This TB classifier incorporating state-of-the-art pattern recognition techniques can then be used to classify images of which the label is not known. Computer Aided Diagnosis will enable automated accurate pre-screening on site by the digital X-ray system allowing radiologists or pulmonologists to focus more on analyzing the images that may be TB. 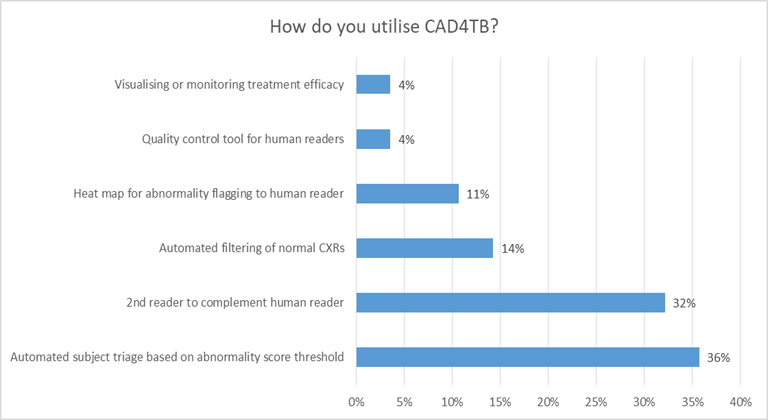 In addition, CAD4TB can contribute to fewer "over-reading" by radiographers or clinical officers. CAD in combination with molecular tests such as Xpert® allows for rapid active case finding, which is particular useful in key populations such as PLWH, diabetics, mine workers and inmates at lower costs compared to Xpert® for all. The objective was to achieve a CAD system with a sensitivity of at least 90% and a specificity of 80%. 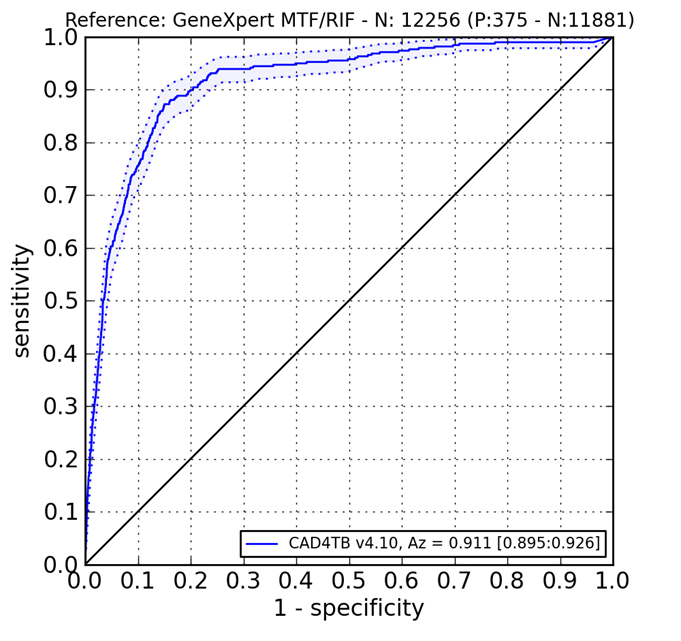 CAD4TB 5 (2017, CE certified) on a large dataset from the Philippines achieved 94% sensitivity and 84% specificity with Xpert MTB/RIF as reference. While developed for TB, this system will be further developed to enable detection of other lung diseases as well. It is thus expected to contribute to a broad healthcare strengthening impact in areas where this is most needed. More than 30 countries use CAD4TB in their TB programs. In the graph below the role of CAD in these programs is illustrated . IRD in Pakistan - one of the early adopters of CAD4TB with Stop TB Partnership/TB REACH support - is now planning to screen up to 5 million people using CAD4TB as a rapid triage in support of the Zero TB initiative. More recent studies with digital chest images from Namibia, Southern Africa, London Find & Treat, Zambia and Tanzanian TB prevalence surveys, confirm that CAD is already as accurate as the trained human reader. As presented at the 2018 UNION Conference by Namibia, CAD4TB accuracy allows the trained human reader to be replaced by this AI algorithm in future surveys. 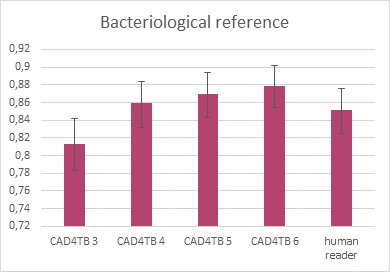 A study was performed on CAD4TB performance in the Philippines to automatically interpret digital chest images made for migrant TB screening programs. This research is a collaboration between Radboud University Medical Center and WHO Philippines with initial liaison by KNCV Tuberculosis Foundation and CheckTB!. 12,256 CXRs from Palawan province of the Philippines ; CAD4TB version 4 achieved 90.0% sensitivity at 80.0% specificity*. 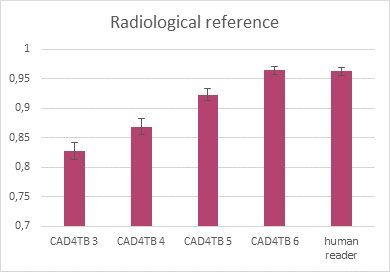 The results with CAD4TB version 5 with (see below) its further increased accuracy, both sensitivity and specificity to augment to 94 and 84% respectively, was published in December 2018. *46th Union World Conference on Lung Health, 2015; Rick H.H.M. Philipsen et al Computerized Chest Radiography Screening to Detect Tuberculosis in the Philippines, 2015. As shown below the (Area under the ROC curve) AUC of CAD4TB has significantly increased since the initial CAD version was released in 2013. 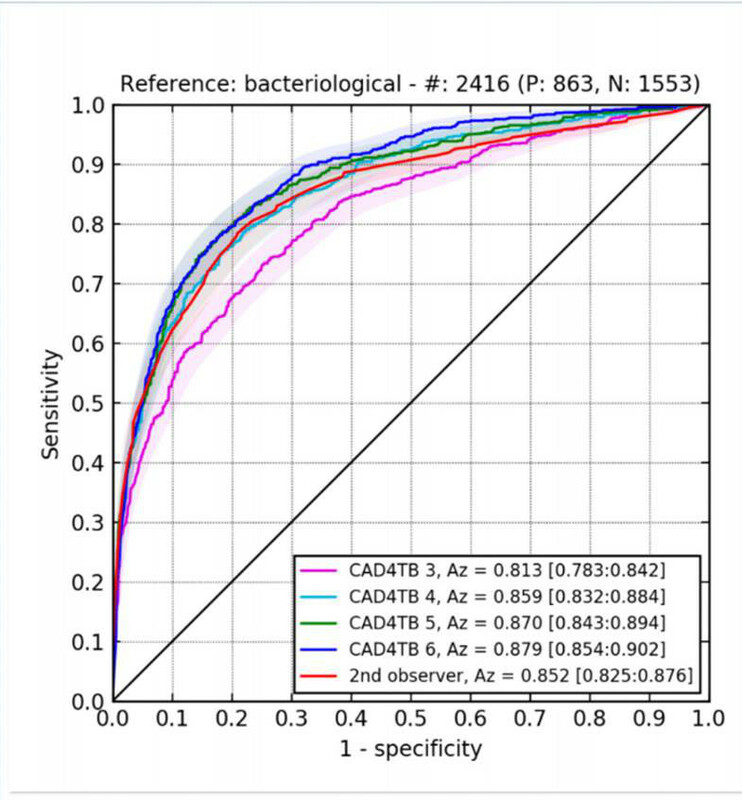 The (Receiver Operating Characteristic) ROC  below provide information on the pooled sensitivity and specificity scores of in total 4 consecutive CAD4TB versions again with reference radiological (expert human reader) and bacteriological (culture). As can be noted the performance in terms of sensitivity and specificity improves per each new version of the software. 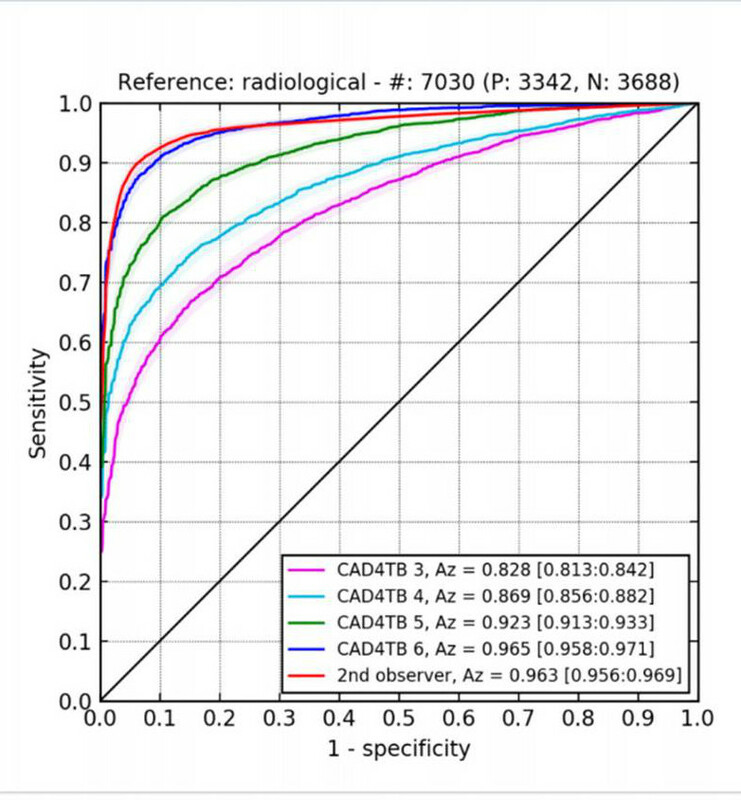 Users can select the preferred trade-off between sensitivity and specificity through setting the CAD abnormality score threshold. This also depends on the diagnostic algorithm and the available budget for e.g. Xpert® cartridges. From the various studies (please refer to CAD Publications section on this site) it can be concluded, that CAD4TB performs similar or better than the human readers in classifying radiographs as being normal or abnormal, suggestive of TB. The performance of the CAD system is expected to further improve with more training of the system. The current version 6 (October 2018) performs equal to expert/radiologist level for classifying abnormal chest images suggestive of TB. CAD as a rapid triage before Xpert® has the potential to cost-effectively scale up systematic screening in key populations in support of the End TB Strategy. This supports the Stop TB Partnership Paradigm shift as also in low resource settings people at risk of TB can with AI support obtain access to high standards of TB care that are available for decades in Western Europe and North America. UNITAID 2015 report on TB Diagnostics Market in Select High-Burden Countries: Current Market and Future Opportunities for Novel Diagnostics. Stakeholder survey performed by CheckTB! among CAD users worldwide, November 2017. 46th Union World Conference on Lung Health, 2015; Rick H.H.M. Philipsen et al Computerized Chest Radiography Screening to Detect Tuberculosis in the Philippines, 2015.